Military Mondays: Special Edition – A Huge Success! On Monday, February 8, 2016 in celebration of the City of Oceanside’s Valentine’s Week, Vows From The Heart teamed up with The City of Oceanside and Visit Oceanside to present Military Mondays: Special Edition at the beautiful Oceanside Marina Suites south peninsula. Rather than a simple seaside elopement, we presented 6 Mini-Weddings overlooking the Oceanside Marina jetty which included chairs for family and friends, a beautiful flowered altar, music and even a small cake. In addition to all this, couples were given a free honeymoon night at a local hotel. 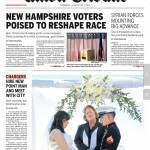 The event was such a success, it even made the front page “above the fold” of the San Diego Union Tribune, what an honor. (Read Here). We want to thank everyone that helped make this all happen: Oceanside Marina Suites ~ City of Oceanside ~ Holiday Inn Oceanside Marina ~ Anar Party Rentals ~ Flowers by Azalea – Floral Boutique ~ Petite Madeline Bakery/Patisserie ~ DJ Wreckrd ~ Saradpon Photography ~ Lavish Lark Weddings ~ Melissa McClure Photography ~ RHS Photo San Diego Wedding Photographer. 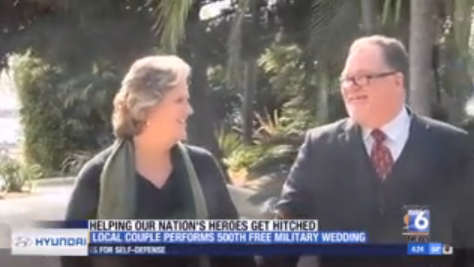 Vows From The Heart Ministries & Elope to San Diego celebrates their 500th FREE Military Mondays celebration on November 30, 2015 at the Bali Hai Restaurant on Shelter Island overlooking San Diego Bay! “Military Mondays™, is a public service and philanthropic effort of Rev. 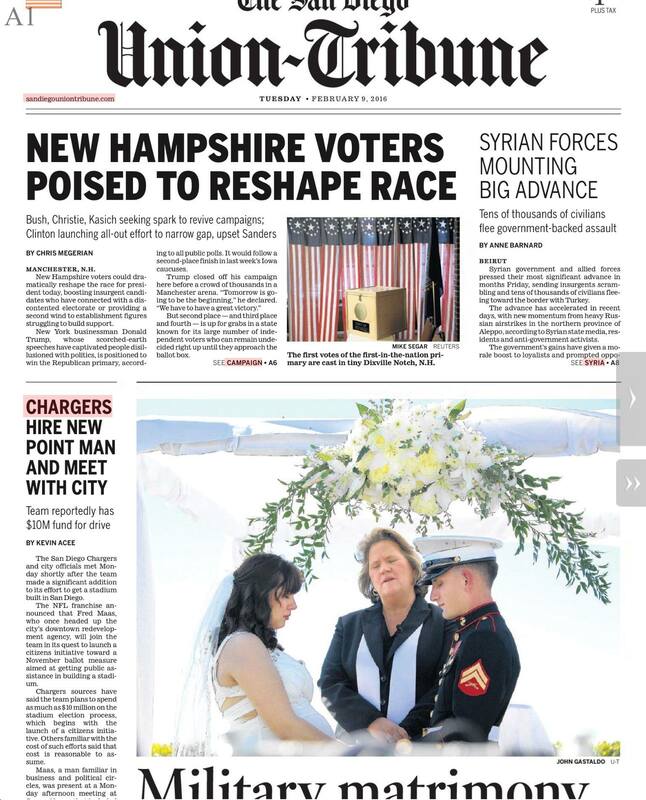 Christopher Tuttle, Chaplain Mary Cyr, Vows From The Heart Ministries and Elope to San Diego™ as an alternative to the “Courthouse” wedding for all Active Military members regardless of branch of service, time in the military or rank. The dictionary defines philanthropic as; showing concern for humanity by performing charitable actions. Rev. Christopher of Vows From The Heart Ministries has taken great pride over the years by offering military discounts for wedding ceremony services and to take this a step further, is giving one day a week to those active Military members wishing for a more romantic setting with a more personal celebration, rather than the County Clerks Office or a trip to Vegas with Elvis. No games, No ticks, No hidden fees or charges…Just a simple way to say Thank You for your service!